Any design, any layout. No coding required. The7 is the most customisable WordPress theme on the market up to date. 750+ Theme Options Never shall you say “we can’t do that, the theme does not permit it” again! The7 features over 750 Theme Options, making it the most customisable theme on the market. With The7 you have the power to customise even tiniest details of your website appearance! Design Wizard Even a beginner can easily handle The7’s wast array of appearance customisation options thanks to the Design Wizard feature. Choose preferred site layout, upload your logo, select the desired color scheme, set up preferred fonts and click the “Create” button. Wizard will create a pro-grade design based on these settings automatically! Design Wizard is also extremely handy for rapid design prototyping. Design Library 25 versatile designs out of the box. You can use them “as is” or as a solid foundation for your unique design. Visual Composer with Ultimate Addons and The7 Elements The7 is the best theme to be used with the Visual Composer and Ultimate Addons. Furthermore we’ve enhanced and extended the Visual Composer with the set of exclusive post types, page templates and VC shortcodes / elements: Super customisable Blog List (new!) Super customisable Blog Masonry and Grid (new!) Mini Blog Blog Masonry & Grid (legacy) Blog Scroller Portfolio Masonry & Grid Portfolio Justified Grid Portfolio Scroller Albums Masonry & Grid Albums Justified Grid Albums Scroller Photos Justified Grid Photos Masonry & Grid Photos Scroller Team Testimonials Slider Logos Benefits Before / After (an essential tool to showcase retouch work for designers and photographers) Fancy Title Fancy Separators Fancy Quote Call to Action Teaser Banner Contact Form Shortcodes for text editor: Gap, Fancy Media, Button, Fancy List 26 (and counting) Ready-Made Websites The7 Comes with 26 pre-made dummy websites complete with exclusive Slider Revolution and Visual Composer templates: The7 Landing Page The7 All Features Demo (with multiple homepages concepts) Seven Dev – Mobile Games and Apps Development Web Master – Website Design and Development Digital Artist – Creative Portfolio Restaurant Building and Construction Hosting Company Psychology Law Firm, Solicitor Medical, Dantist Cafe, Coffee Shop CV, Resume Dance School Seven Product Expedition, Travel Agency Marketing Agency Creative, Digital Agency Seven App Beauty Studio Business, Corporate Photography, Portfolio Shop, Store Creative Agency Conference, Business and Finance News, Blog Responsive. Fluid. Retina Ready. Your site will always look sharp and utilise 100% of screen estate on every device. The7 has 3 individually customisable display modes: for desktops/laptops, tablets and phones. Unlimited Header Layouts 6 basic header layouts with innumerable variations and setting for each: Inline (menu on the right of the logo) Classic (menu below the logo section; “centered” layout option available) Split-header (centered logo with menu on each side) Side (vertical header on the side of the page) “Navigation on click” with side header (side header revealed after the click on the menu icon) “Navigation on click” with overlay navigation (modern overlay navigation revealed after the click on the menu icon) You can also make pages stand out with transparent, overlapping and header under slideshow options. Mobile Headers 4 mobile header layouts. Option to select different header for phones and tablets. Premium Sliders Slider Revolution, Layer Slider, Photo Scroller and Porthole Slider comes bundled with The7. Fancy Titles This feature gives you an option to add a background image, page title and breadcrumbs (numerous interpositions) to each page/post/project/etc. individually. Sidebar and Footer Customise the appearance of your Sidebars and Footer. Assign individual Sidebar and Footer to any page/post/project/album/gallery/microsite/etc. you like. Multiple Showcase Options for Your Creative Works There are many ways to showcase your creative works with The7. To name a few: 4 different slideshows Masonry, justified grid and list portfolios and galleries Responsive magnific popup lightbox Dedicated Post Types for: Portfolio Testimonials Team Logos Benefits Photo Albums Slideshows Plenty of Blog, Portfolio & Galleries Layouts You can choose: Masonry, grid or list view. Justified grid layout for portfolio, albums and galleries Infinite scroll / lazy loading option Any number of columns + min. column width option Additionally you can specify the appearance of photo album: Lightbox Photo Scroller Simple slider Metro List Unique Page Templates System Innovative page templates system in The7 allows you to display your content like portfolio projects, blog posts or team members in a couple of clicks. Moreover, you can specify which categories to show on a certain page. Therefore, you can create an unlimited number of different portfolios, galleries, blogs, teams, etc.! List of page templates: Default Albums – justified grid Albums – masonry & grid Blog – list Blog – masonry & grid Gallery – justified grid Gallery – masonry & grid Microsite Portfolio – justified grid Portfolio – list Portfolio – masonry & grid Team Testimonials 230+ Settings for Pages/Posts/Projects/Etc. In The7 you can individually customise header layout and type, footer, sidebar and numerous other setting for each page/post/project/etc. Microsite A unique page template that can be used for landing pages, one-page-sites, blank pages,.. even sites-in-site! Features: Select custom menu Enable / disable top bar, header, floating menu, bottom bar Use custom logos, logo link and favicon Enable / disable beautiful page loading Choose wide or boxed layout Custom CSS field All regular options like header, slideshow, sidebars, etc. settings are also available Mega Menu Features: Icon-font icons Subtitles Multiple menu rows / columns Numerous additional styling options 100% WooCommerce Compatibility. That’s right – no need to mess with WooCommerce styling to fit your site perfectly. The7 will apply all required highly customised styles based on your design automatically! Specially optimised to sell digital, as well as physical, goods. $135 Worth of Premium Plugins Included The7 offers more value for money. 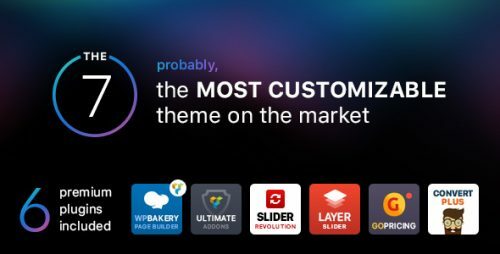 It includes $135 worth of premium plugins: Slider Revolution, Layer Slider, Go – Pricing tables, Visual Composer, Ultimate Addons and Convert Plug free of charge! Compatible With Most Popular WordPress Plugins Enjoy the bast in class plugins compatibility. To name a few: Contact form 7, WPML, All in One Calendar, Events manager Pro, Gravity Forms, WooCommerce, Yoast SEO, All in One Seo Pack, W3 Total Cache, WP Super Cache, JetPack, Luv Comments, Disqus, Geo Post, Ultimate Maintenance Mode, NextGEN Gallery, etc. Optimised for Search Engines (SEO) The7’s HTML5 code meets best SEO practices. It is officially mobile friendly (confirmed by google). Theme is 100% compatible with industry-leading SEO plugins like “All in One SEO Pack” and “Yoast SEO”. Optimised for SPEEED! Correctly set up sites build on The7 will have better loading time and scores in tests like GTMetrix and Pingdom then standard WordPress themes! 100% Translation Ready and WPML Compatible The7 is 100% translation ready and fully compatible with WPML. Extensive documentation. Premium Class Support for free. Faced a problem? No worries – we have the knowledge-base, the interactive troubleshooter and our premium-class customer support service is always there to help you. Unlimited Design Styles Due to The7’s versatility you can create almost any design style you like. To name a few: flat, minimal, clean, iOS, macOS, OS X, material and metro design, etc. 1. New: much improved and extended Mega Menu. Note, this is still a beta feature! 1.1. Theme Options > Top Bar & Header; under "Submenu" tab, "Mega menu background settings" and "Mega menu items" block were added. Here you can setup: - mega menu background (under-layer) paddings; - columns paddings and columns width (latter works only for non full-width menus); - menu items typography, colors and paddings, etc. 1.2. Appearance > Menus; all mega menu related settings were moved under "The7 Mega Menu" button. Numerous features and corresponding settings were added, among which: - display a widget area (use with caution! ); - set a background image for the menu; - hide certain menu columns in mobile view; - visually choose a menu item icon (from icon-fonts uploaded to the theme); - upload a menu item image and chose its position, border radius, paddings, etc. 2. New: now you can manage widget areas right from Appearance > Widgets interface. 3. Improved: WooCommerce 3.6.x compatibility. 4. Improved: new settings for "custom menu" and "shopping cart" microwidgets. 5. Fixed: issue with transparent headers not working properly on iOS 12.2. 6. Fixed: issue with incorrect font family for fancy header on product page. 7. Fixed: issue with "media gallery" "masonry grid" images not loading when lazy loading is enabled; also "load more" button displaying when placed inside an Album. 8. Fixed: issue with custom settings not working with new font awesome benefits icons. 9. Fixed: issue with the floating logo not showing up when there is a custom logo set in branding options, and the file is the same as the main logo. 10. Fixed: issue with next menu level indicators missing in side menu. 11. Fixed: issue with full height/width setting for buttons not working with justified menu layout. 12. Fixed: issue with images not showing up if pagination field in "Photos Carousel" is empty. 13. Fixed: issue with "Photos Carousel" doubling the number of images. 14. Fixed: issue with "Main" and "Floating" logos showing up simultaneously in mobile and tablet views. 15. Fixed: issue with "Team Carousel" bold/italic/uppercase settings not working. 16. Improved: general compatibility with plugins that use WP audio player. 17. Improved: updates related to fancy header in WPML-config. Other minor improvements and under-the-hood changes.